REV UP, & COOL DOWN! Zirgo's 14 inch "S" blade automotive cooling fans represents the ultimate in cooling technology. With a length of 14 inches, a height of 14.8 inches, and a depth of only 3.5 inches, the Zirgo 14 inch flat blade cooling fan packs maximum performance into a minimum of space. Zirgo high torque fan motors feature sealed ball bearings and fully balanced blades which ensure low noise levels and a long life of smooth operation. To ensure maximum performance, all Zirgo fans offer reversible blades allowing them to operate as pushers or pullers. Zirgo's revolutionary four point mounting bracket ensures easy placement for maximum performance on your vehicles cooling system. All high performance Zirgo fans offer plug-in color coded harnesses resulting in easy installation even for the "weekend" mechanic. All Zirgo high performance cooling fans are tested several times for maximum performance and operation. 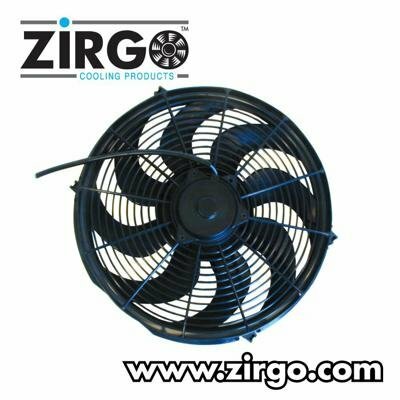 By the time the Zirgo fan reaches your door you can be assured of a long life of quick, quite, and smooth operation. Zirgo's ultra thin design and unmatchable performance, along with a Limited Lifetime Warranty, make Zirgo the optimal fan for the ultimate vehicle. For unbeatable heat, fight back with Zirgo's strongest motors! Zirgo's unique revolutionary motor designs offer low amp draw, while providing future performance upgrades. To ensure peak performance Zirgo's easy to remove motor allows you to upgrade or exchange your motor in the future. Simply remove 4 screws, insert the new motor, and your done! Let Zirgo high performance cooling fans cool you down, when you heat up! .